From December to January, the Grubbs Gallery will display work by the Fine Arts faculty. Included in the exhibit are pieces by fine arts teachers Susanna White, Natania Hume, and Rachel Chambers; photography teacher Ed Hing ’77; costume designer, Ilene Goldstein; and art intern, Kate Verdickt ’05. 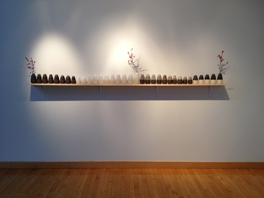 The exhibit features bud vases, in the style of contemporary ceramic artist Edmund de Waal, by Ms. Hume, who is also the gallery curator; costumes and jewelry designs by Ms. Goldstein; and landscapes and abstract paintings by Ms. White. Also featured are a selection of photographs from Mr. Hing’s Ten Years/Ten Countries, celestial paintings by Ms. Verdickt, and Ms. Chamber’s work, an installation made completely out of cardboard that covers part of the gallery in undulating 3D forms. Read statements from each artist here. The Visual Arts Faculty Show runs through January 6, 2014. There will be a reception with the artists on December 18 from 6:00 to 7:30 p.m. in the Grubbs Gallery. Located at 40 Park Street, Easthampton, in the Reed Campus Center, the gallery is open on weekdays from 8:00 a.m. to 5:00 p.m., and on Saturdays from 8:30 a.m. to noon. On Thursday, October 13, Middle School students took part in an interdisciplinary, collaborative field trip designed by teachers Jane Lucia (science) and Natania Hume (art). The trip took advantage of the wonderful resources at nearby Smith College in order to touch on the disciplines of art, science, English, and geography. See the full gallery of photos on Flickr. The trip began with a guided tour of the Lyman Plant House, which is a series of greenhouses containing plants from many regions and climates all over the world. In the plant house, students were given time to observe a plant of interest to them, making notes and using as many descriptive adjectives as possible. They later exchanged papers and made drawings according to each other’s descriptions.